I know the sky is blue all year long but I find it is an even prettier shade during the fall. Bonus if you can see the contrast of the blue against red leaves. 2. Apple Cider: Hot or Cold? I just recently discovered alcoholic cider so cold is definitely my preference. An apple dipped in caramel on a stick, no? But this dip with the cream cheese and skor bites, I'll take it! 4. Pumpkin Doughnuts or Apple Cider Doughnuts? I've never had either, but homemade donuts were never a thing at my house. I'll just go with some chocolate Tim Bits! Both can be good for different things. 6. 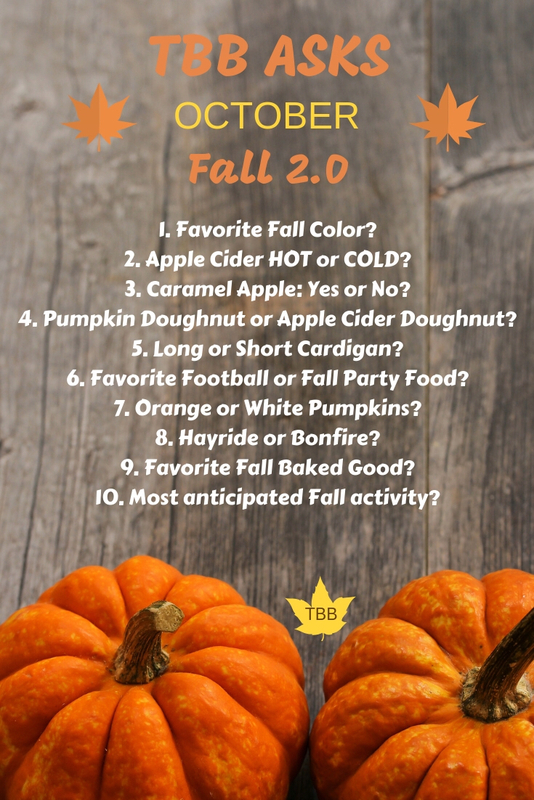 Favourite Football or Fall Party Foods? 7. Orange or white pumpkin? We always get orange pumpkins but this year I want to get one white one so I can do a Day of the Dead pumpkin. 9. Favourite Fall Baked Good? Since we often travel somewhere in the fall, I will say a trip. I like the other stuff too but nothing beats going away somewhere.